Browsing the interwebs and having found the 99 cent mouse in the previous post I looked further and found a Mechanical Backlit keyboard for about 40 dollars! And from what I could find, it might actually be the real deal. So I ordered one and it arrived this week. Let’s take a look shall we. 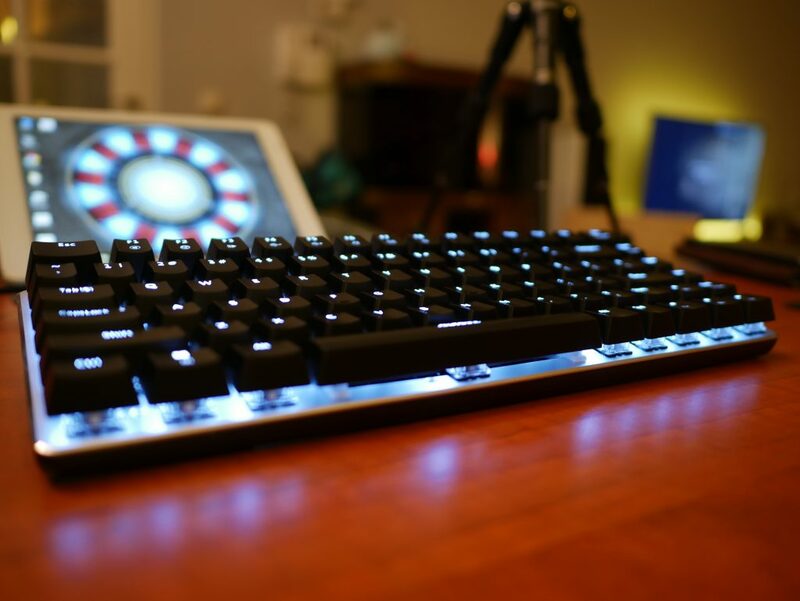 The keyboard promises to be a true mechanical keyboard, available with 2 type of switches mysteriously called “Zorro blue” and “Zorro black”. I chose the “blue” switches with a completely black keys. It comes with a pure white backlight. It also promises some interesting lighting modes and media keys such as volume control, etc. The keyboard has a Mini-USB connector and comes with a pretty nice cable included too. So it’s ready to go right from the box. All in all the promise of this keyboard was very good. And if it really can deliver, that is quite the deal! The keyboard, the Ajazz AK33 by the way, further boasts common specifications. It supports any operating system supporting the normal HID interface standards (Android, iOS, Windows, Mac OS, etc.). Although it’s backlit, it doesn’t come with any fancy control software or RGB. There are variations that do though but those are automatically more expensive. Did you checkout my video review? If not, watch it first and then read on! To my surprise, it actually does very well. This review has been typed on it, and all the keys and switches behaved as I’ve come to expect over the years from Mechanical switches. I purchased the “Zorro blue” version and it’s very comparable to cherry MX Blue switches. They don’t feel completely the same, but all of the good features (tactile feel, tension, clicky sound, etc.) come very close and from what I’ve noticed up until now makes for a pleasant and well behaved switch. Construction wise you can see some corners where cut. It has a glossy black plastic shell and with some pieces you can tell it’s more of a budget design. But in my opinion, nothing’s really wrong with that. Inside of the plastic shell there is an aluminium plate on which the keys are located. 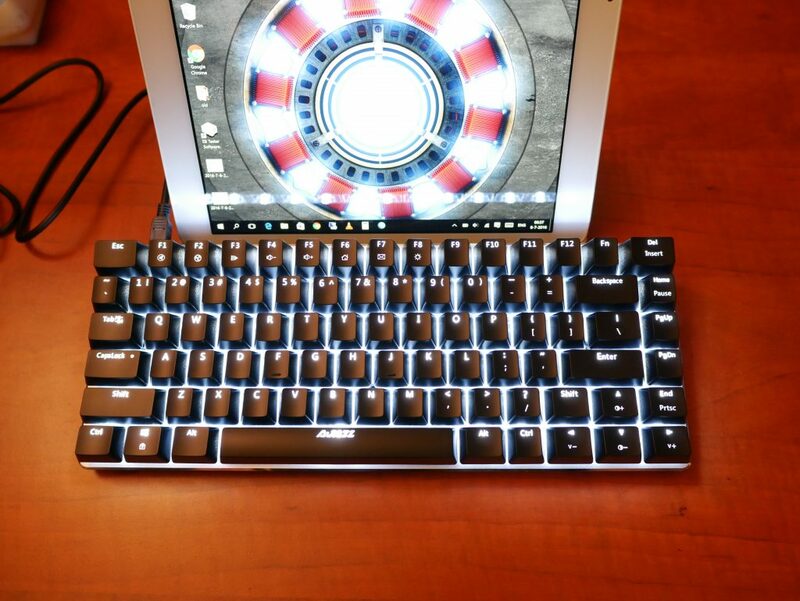 This also gives the keyboard very good rigidity and while light, doesn’t feel like total plastic crap too. One point of concern is of course quality. And not much can be said about that yet really. Up until now it’s held up to my daily use and hasn’t shown any problems. I also don’t see anything going wrong anytime soon unless maybe a switch fails. I think that is also it’s weakest part. A mechanical keyboard is mostly a shell which houses a lot of switches. Most often, if a PCB works it will keep on working unless you physically brake it or moisture gets involved. So that leaves only the switches as a point of failure. And while I’m sure they’ll fail much quicker then a true Cherry MX blue switch, if it holds out for 1 or maybe even 2 years, I’d be more then happy with it. 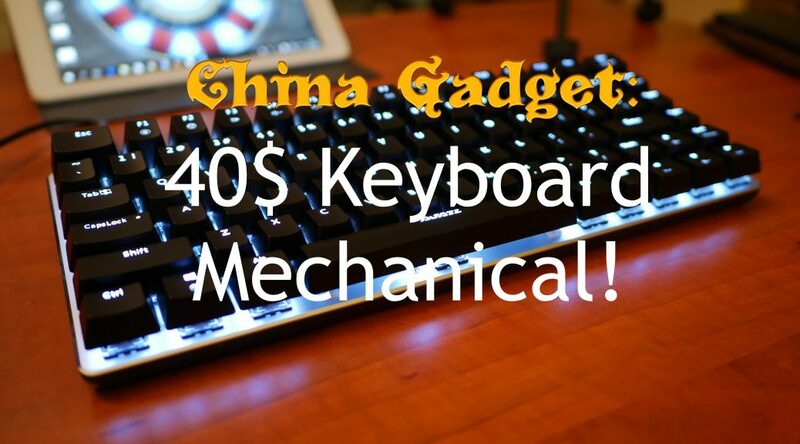 If you’ve been wondering about Mechanical keyboards but always found them too expensive, but do want to know what the hype it about, give it a try! You can buy one easily on Aliexpress by clicking here. If you combine it with a cheap mouse from the previous post, you’ll have nice looking hardware for not much money, and while not excellent like the expensive stuff they are certainly worth their money! They also have a RGB version as I mentioned above. Get one for your second computer, your kids as a cool “backlit” keyboard or maybe as a compact server keyboard you can easily take along. I can think of loads of different uses where before I would use a very mediocre option I had lying around. I just wanted to thank you for doing the review. Very informative and helped me decide on my purchase of this keyboard. However, I went with the ak33 rgb for just a little more.